The iPad is the king of the mountain when it comes to school officials’ current use of mobile technology, according to a new survey of district officials, who also offered their preferences for the kinds of apps they want to see in classrooms. More than 80 percent of district technology officials said districts use or plan to use iPads over the next year or two, according to the results released by Interactive Educational Systems Design, Inc.
Google Chromebooks came in a distant second, with 31 percent of district officials identifying that tool as the mobile technology they have in place or are planning to adopt. Twenty-seven percent said they are using or will use “mixed technology” supplied by students, as part of bring-your-own-device approaches. Android Tablets were next in line, the choice of 17 percent of respondents. The results are included in the National Survey on Mobile Technology for K-12 Education, which is based on a sample of 558 district technology and media directors, 450 of whom answered most questions. The margin of error was 4 percent. Interactive Educational Systems Design is a company that provides market research and analysis, along with other services. The results of the survey are included in a report available at a cost, though the company made some of them available to Education Week. The survey also asked district officials to name the types of apps that would be most beneficial to student instruction, choosing from list of 18 options. 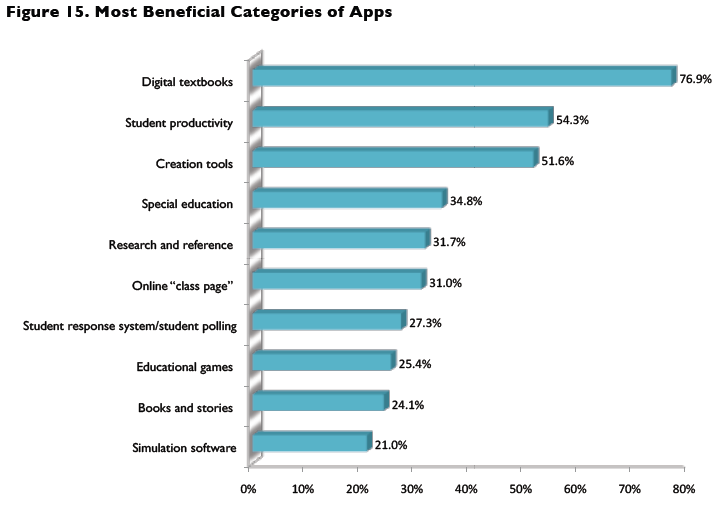 An overwhelming number of school officials, 77 percent, said they see apps that offer digital textbooks as most useful. Fifty-four percent of respondents, meanwhile, said they wanted apps focused on “student productivity,” such as those offering storage of student files, note-taking, and scheduling information. The biggest potential benefit of adopting mobile technology is its ability to engage students, according to 62 percent of respondents. Creating personalized instruction came in second, at 43 percent. Asked about the biggest barriers to adopting mobile technology over the next year or two, the vast majority of respondents, 78 percent, cited the pricetag. Lack of tech infrastructure was the next biggest hurdle cited, by 50 percent of those surveyed. Twenty-five percent cited the challenges teachers face in integrating mobile tech into instruction as the biggest, looming problem. When asked to name all the sources that their systems use to fund mobile tech purchases, the largest number of respondents, 66 percent, cited district technology funds, while 54 percent, cited general funds from their school systems. Forty-three percent said they received state funding and grants, and 37 percent said the drew from federal money and grants.